As we all are in the New Year, I believe all have decided to do something different and new , unlike during the last year. Some may don’t want to repeat the same mistakes. Some people want to give up something while others want to live a peaceful life by forgiving their enemies and loving their neighbors. But as for me, I plea to God for a ‘Grace Mark’. And my author is holding me to write this to you all in this New Year. I remember my school days. I was weak in Mathematics . My greatest enemy at that time was Maths and my Maths teacher. But in my last semester, I passed in all other subjects except Maths, in which I got only 34 out of 100. I had failed in Maths. But my Maths teacher who I thought was my greatest enemy, while checking my paper , knew that I was going to fail. But , then she thought of one year …yes, that would be waste of one year. So she gave me one mark which is popularly known as grace mark, and I was passed that year. Now that one mark is not mine, and I can’t boast about it. I cannot say that I had passed by my ability. It was that one mark that saved my year. Whatever was my efforts, it was worth only 34 marks, but that didn’t help me .Now this is just academic, but what about life??? If my teacher was so merciful enough to give me a grace mark, then how much more will our Father in heaven give you His grace in your weakness. That one mark was sufficient and more than enough for me to pass that year…. Then how much more the grace of God will be enough for our weakness. My teacher did not see how I looked nor did she check as to how regular I was in class. She didn’t check my history, but she thought of one year that would be wasted. I was not worthy to get that one mark and it was not my ability that took me to the next grade. I had failed, but my teacher was merciful to me. Likewise, we all failed to please God. We failed to recognize Him. The law, our deeds and our family status failed to draw us close to God. But still, God was merciful to us and He was mindful of us . He saved us from the yoke of Satan. All glory to Jesus Christ. It was not our skills that saved us, nor were our good deeds, but it was only His grace. I had scored only 34 marks in Maths. Likewise, all those things we think that we have scored is not enough to save us but by His grace, we can boldly enter through His gates and stand in front of the holiest. So you better praise God for His grace. How many times were you on the verge of falling ? But the grace of God brought you this far. Many times we became weaker and weaker but remember, it was not by our ability that we stood. It was all His grace….and I thank Lord not for the new job ,not for a new car but I thank God for His grace. If it would not have been for His grace, I would have failed and fallen in every aspect of my life. 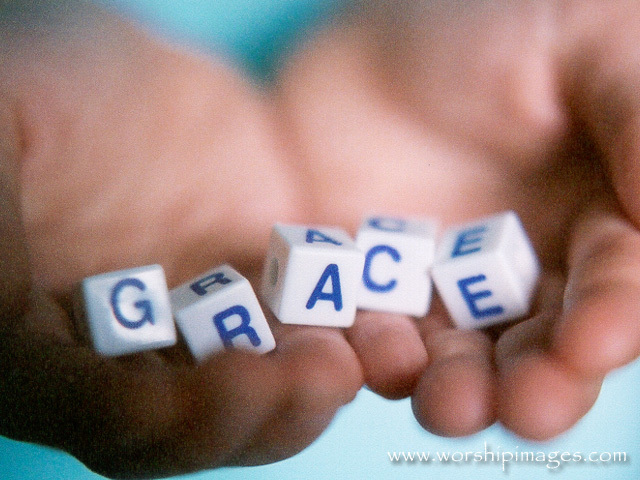 But I remember one sound saying to me that “My Grace is Sufficient for Thee”. Yes and I need that grace not only this New Year but all the days my life. I wish some of you could plea to God for His grace. For the law was given by Moses but the grace and truth came through Jesus Christ (John 1: 17). It is also written in Ephesians 4:7 , “But to each one of us grace was given according to the measure of Christ’s Gift.” It is a gift of God and it is given in measure. If we go through text of Eph Ch 4 : 11 onwards, God gave His grace as the measure of His gift, some to be apostles ,some prophets, some evangelists, some pastors and some teachers. Why this grace was given to them ? It was given to them for equipping of the saints for the work of ministry ,for edifying the body of Christ so that no one should boast in His knowledge ,and in His ability but rather surrender to the grace of God. So when we preach, when we do any ministries, it is not our ability but it is the grace of God who leads us. I am concerned about today’s Christian ministries and ministers …Many boast about their degree’s, doctorates, biblical knowledge etc. But will any soul be saved with your degree and doctorate?? Will any soul be saved by your own ability?? I know some of our ‘so called’ evangelists and teachers, who have attained doctorates and similar kind of degrees feel down when they are called pastors. Apostle Paul in his epistle to Philippians 3: 4 says,”….. though I also might have confidence in the flesh .If anyone else thinks he may have confidence in the flesh, I more so.” Verse 7, “But what things were gain to me, these I have counted loss for Christ.” And again he says in verse 9, “…. and be found in Him, not having my own righteousness.” Paul had lots of things to boast about in his flesh, but he knew that all that would not save him…So he pressed on by forgetting those things which are behind and reaching forward towards the goal. If anyone of you still have self righteousness and you boast about your ability and knowledge , this message is for you. It’s good that you are ordained. It’s good that you have done biblical theology and attained degree’s but all that will not help you to press toward the goal. It is only the grace …grace of our lord Jesus Christ who strengthens you to press toward the goal. It was all His grace that saved mankind who fell short of the glory of God. I don’t need to explain as to how man was clothed with the glory of God as I have already mentioned in my earlier living Rhema. Romans 3: 23 and 24 says, “for all have sinned and fall short of the glory of God. Being justified freely by His grace through the redemption that is in Christ Jesus.” We are saved by His grace and we live by His grace. So now you got why Noah was perfect in his generation ? It was because he did not stumble in the word of God spoken to him. He put his faith on God . That’s why he believed on that thing which he had never seen before. This is what God wants from us…If he is saying anything to do, we must believe in Him and not stumble in faith. Genesis 6:5 says,” then the Lord saw that the wickedness of man was great in the earth, and that every intent of the thoughts of his heart was only evil continually.” So the Lord said “I will destroy man whom I have created from the face of the earth. But Noah found grace in the eyes of the lord….” This text really touched me …. All people at that time saw anger and wrath in the eyes of the Lord but Noah found grace in the eyes of the Lord. You may not have anything to boast about in your life but if you have grace, its more than enough .Pray for more grace. This world is a sinking ship …It is effected by financial crisis, poverty, earthquakes, war, terrorism, diseases etc. and don’t think that everything will be ok within next 5 or 10 years, because the leader behind all this is Satan …There will be peace only then when God will puts this ‘Liar Devil’ to the ‘lake of fire’ forever. Until then, no matter which government, parties, leader may rule here, there won’t be any peace in this world. But I thank God that through Jesus we got the grace to enter into His peace …the ark of God. There is safety only in the ark of God and God will remember those people who are in the ark. Rest all will be destroyed. Let us pray to God that He may render His grace to us so that we have communion not with this sinking world, but with Christ and His promise. Noah and his family were saved from the great flood because he found grace in the eyes of the Lord. Jesus is coming soon and we need His grace abundantly so that we may also be saved from this sinking world to the everlasting firm promise of God. Let us ask for His grace to live in our daily life of holiness and according to His will.